It never was our intention to detail our photographic proceedures on this site; we consider it neither practacle nor particularly sensible to try to explain the processes that lead to good pictures for the simple reason that our understanding is limited. On the other hand we have been asked on several occasions to explain how we do things so, along with a few brief notes which more or less encompass our knowledge of the subject, here goes. Not so long ago, when it was normal to work with film rather than digital cameras, it was vital to understand the physics behind macrophotography otherwise a great deal of time and effort and film would have been wasted. Even with such an understanding there was always an element of luck because with so many variables to control, and sometimes these are very subtle, you got either well exposed and sharp pictures with good depth of field or, for some reason obvious with hindsight, you did not. It was also necessary to record the camera settings for each shot and mark the film in some way so that it could be identified a few days or weeks later when developed and printed. You never quite knew what you were in for but a generally accepted principle when photographing stuff between one and ten millimetres long was that most of the shots would be useless. If good luck accompanied good judgement, the odd acceptable shot was worth the wastage. Things got better with experience but, if you were paying for the education, it did not come cheap. Things have now changed, with the advent of digital cameras the wastage is probably the same but it costs nothing and the results are instant, the education is therefore much more affordable. The cost of equipment can be substantial but the potential for good results is very real. There are two functions needed in a camera in order to take close up pictures; the ability to control exposure times and the ability to control the f-stop or apature size. For accetable results we need to be able to manipulate the depth of field, this is the range of distance in front of the lens that will be in focus so obviously this needs to coincide as well as possible with the 'thickness' of the subject or specimen. Cameras do not have a direct control ie. a dial that will change the depth of field so it need to be manipulated indirectly. Generally speaking the higher the f-stop, the wider the depth of field but this only works up to a point because at high f-stops (tiny lens apatures) other factors affect the results eg. the 'circle of confusion', which is basically how blurred a point needs to become before it is perceived as so, here although a decent depth of field may be obtained the overall image may be unaccepable due to blurring or softening outside of this range. There are also refraction effects within the lens that affect the picture quality when using very high f-stops. A major problem with macrophotography is that the depth of field extends some distance in front of as well as behind the point of focus, usually about equal with standard lenses, so that in a very real sense around half the range of focus is wasted on empty space in front of the subject. Depth of field is usually marked on lenses in metres or whatever according to the f-stop being used. So, up to a point we need to use a high f-stop. This usually places constrictions on other aspects of the process, of which more soon. Most cameras will allow apature priority ie. set the f-stop and the camera will automatically open the shutter for the correct time. They will also work the other way around ie. shutter priority where you select the time of the exposure and the camera will select the correct aperture (f-stop). Either way you can achieve a decent depth of field. They may also allow fully manual operation where you select both independently. 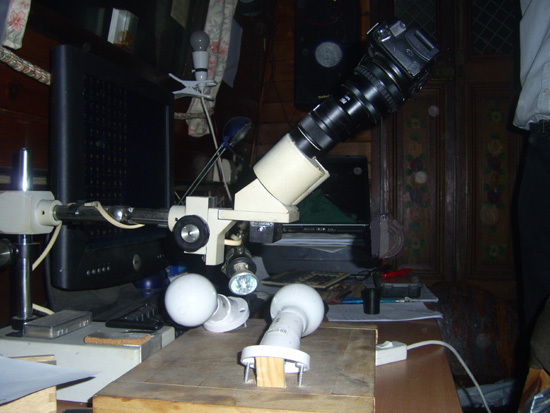 For macrophotography there are lots of mechanical and optical devices available to produce magnification eg. extension tubes and bellows that move the lens away from the camera body thus producing a larger image on the plate, and close up filters which attach to the front of the lens and act like a magnifying glass. Extension tubes reduce the amount of light entering the camera while close up filters can cause spherical abberation when used in combination. An ingenious device is the reversing ring which allows a standard lens to be reverse mounted on the camera, when used this way round a standard lens becomes a macro lens. A whole range of macro lenses are available. The most versatile camera is the Single Lens Reflex type, or SLR, which allows through a series of prisms and a mirror the user to view the subject through the lens rather than a viewfinder. Being able to picture an object in close up also depends on two other factors, lighting and some means of mounting the subject before the lens. Both these factors are affected by the need to obtain depth of field. 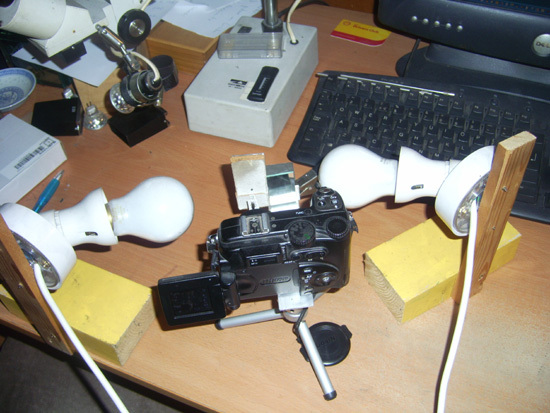 Using a small apature means either a longer exposure or a stronger light source and in practice we have to compromise. Various lighting devices are available eg. flash guns, ring flash, bulbs and a whole host of things designed to reflect or filter light in some way to produce desired affects. Apart from providing adequate levels of illumination the light needs to have a decent spectrum so that colour will appear close to natural. Inverse square spreading with close illumination means that moving the light source away from the subject, or the subject away from the camera, will have a drastic affect on light levels. It is natural enough to mount the camera on a tripod as these are very versatile and designed to be comapable, fair enough, and it is also very tempting to point the camera thus mounted at the subject and take a few shots but this is the part we have found most problematic. Framing the subject apart, it thus appears straightforward to begin macrophotography (as opposed to microphotography which deals with combining a camera with a microscope), all you need is a digital SLR, a macro lens, tripod and a strong light and off you go. Our problem was that we had none of these and so had to improvise a bit. We had, and still have and use, a Nikon 5400 Coolpix with its fixed lens. This was purchased before the website was thought up, no macro lenses are available, it is not an SLR and the apature only closes to f 7.6. So at face value this appeared totally unsuitable, and in a technical sense or for that matter any other sense, it was. Or should have been. On the plus side it can be used fully manually, it is rechargable and so works forever at little expence and the results can be viewed very quickly on the PC. It also attaches to a tripod but, unfortunately it proved more or less impossible to maintain any kind of focus during long exposures. 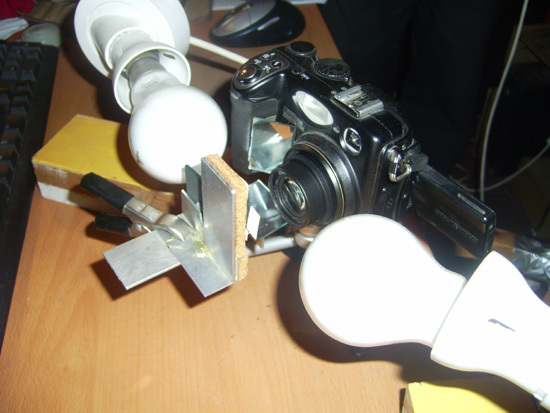 Our answer was to construct an aluminium 'arm' to mount between the camera and tripod, onto this arm the subject could be mounted and moved toward or away from the lens. In theory any movment in the subject would occur in the whole set up and could be ignored, this proved to be generally successful. To help with this we always use the camera's time delay so that exposures are as hands free as possible. We have tried lots of different types of lighting and have found that with subjects so close to the lens surface, flash of any kind produces too much glare or 'fog', halogen bulbs are blue deficient so produce yellowish pictures, and daylight is not strong enough unless used outside on a sunny day. 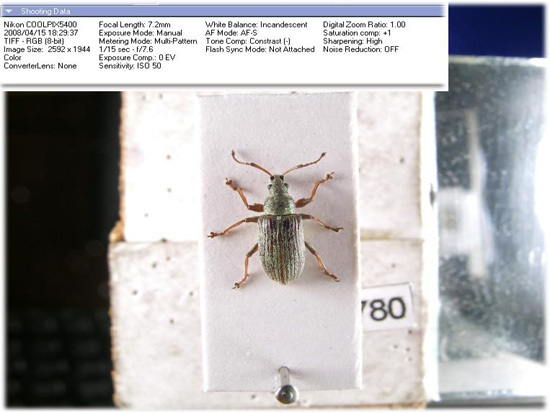 What we have found will give acceptable results in terms of colour and illumination are 75 watt photoflood bulbs placed close to the specimen. These will produce glare and bleach some parts of the subject but from a series of shots taken at different settings there are usually a few good ones. Our bulbs are mounted on wooden blocks to allow movement. We use autofocus and take series of pictures at different apertures and with different lighting aspects. The digital viewfinder, actually a screen, is not much good under these conditions as it gives no real idea of sharpness or illumination so we simply set things up as best we can, take a series of pictures, and download them for viewing on the PC. We find that even a tiny amount of digital zooming has a drastic effect on picture quality and so should never be used under these conditions. All pictures are taken at high resolution which means that the camera will take only 17 exposures with 256 memory card in a series but the improvement in picture quality is worth it, good ones are converted to jpegs for the site. That is just about all there is to it, along with a few years of experimenting and experience combined with a deal of patience of course and for good or bad we think the results are adequate to illustrate the specimens and, in most cases, show at least some, if not most, of the characters mentioned in our descriptions. Very fortunately the Nikon can be attached to one of our microscopes and here we apple the same philosophy of taking series of pictures at different settings and with varying illumination if necessary, unfortunately here the subject is mounted directly under the lens and remote from the camera body so great care must be taken to avoid movement. Given the option and with hindsight we would have gone for an SLR as these are much more versatile but we press on with what we have and, in our humble opinion, think the results are good enough. For now!